Where is it ? About 110 Kilometres from Faro Airport. About one hour thirty minutes transit time by car. How Big is it ? The area around Vila do bispo including local parishes has a population of about 5000. The Town of Vila do bispo itself is still quiet small though. Who goes there ? 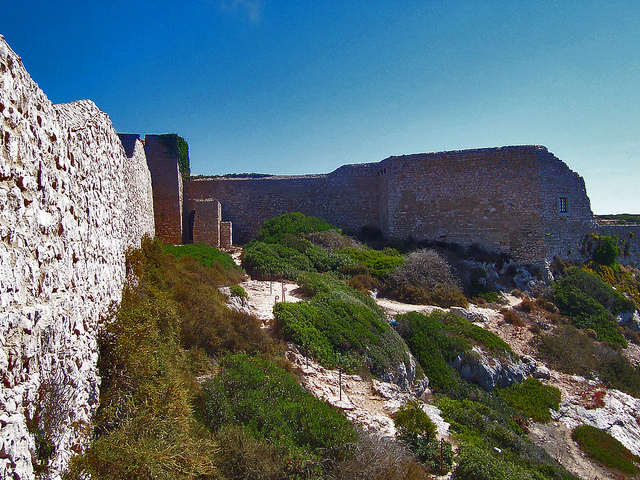 Vila do Bispo is on the western tip of the Algarve between Budens and Sagres. This is a protected area for natural habitat and is considered off the beaten track. Popular with walkers and those seeking a look at fading Algarvian village traditions. What about Food and Accommodation ? Vila do Bispo has plenty of good if not particularly fancy restaurants. There are also several beach diners on the Praia do Castelejo. The district of Vila do Bispo with its 70.000 hectare Parque Natural do Sudoeste Alentejano e Costa Vicentina is one of the few locations of the Algarve where the natural environment has remained untouched and the rich cultural and historical heritage has been preserved. Tourists passing trough Vila do Bispo on their way to Sagres should have a look at the octagonal tower of the main church completed in the 18th Century and the nearby Ermida de Nossa Senhora de Guadelupe, built by the Knights Templar in the 13th Century. The area is known for its fresh fish and local sea food, including rock barnacles harvested by fishermen at no small risk from the rocks along the shore. Every village around the Sagres area has a noteworthy navigator or Adventurer and vila do bispo is no exception being the birthplace of Fernao Mendes Pinto The first European to land and try to trade in the Japanese Archipelago. The Nearest beach from the old whitewashed town is the Praia do Castelejo. It is a huge secluded beach but not the most accessible as you will have to navigate heavy sand dunes to get to the flats. On the right day you can see why Portuguese Navigators in this region looked to see and believed there was something else out there. Vila do bispo may be secluded but it is on the major bus route from Sagres to Lagos although a car would be a handy thing to have.